Now that the blogging contest that shall not be named is over, I can pimp another good cause. This is Donna. I'm sure you'll agree that she's lovely. 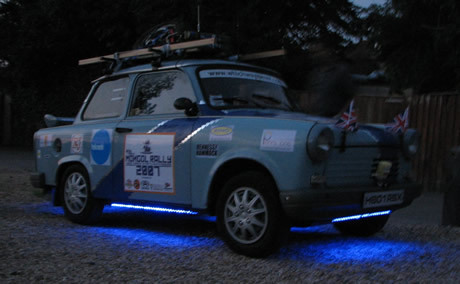 My pal Graham and his brother Lewis are driving this exquisite piece of automotive finery from London to Mongolia, as part of the Mongol Rally 2007. You can read more here, or just go directly here to help them out (it's not just for fun, it's for charity as well). Last we heard from the boys, they were in Baku. Don't know where that is? Find out in an update from them after the jump. It's a much better story than any I have to tell right now. (Baku is the capital of Azerbaijan for those of you that don't know. And some of you doubted whether Donna would make Dover!) It's hot here. And the only thing more prevalent than the heat is the corrpution. After a good trip through Turkey, and a really enjoyable time in Georgia, we have had hassle and aggravation in Azerbaijan. While the locals seem friendly enough, although not averse to overcharging, the officials are the worse we have encountered so far. Having waited for hours to get in, refusing repeated attempts for bribes and souvenirs, we were subsequently stopped twice on the way over by policemen demanding money, the main grounds for this being that they are policemen and that this somehow entitles them to whatever they want. We have argued with them, and so far got away at only the cost of cigarettes and energy drinks. The roads here are interesting too, ranging from really quite good to really quite unbelievably bad. So far, however, Donna has coped extremely well, the overheating remaining a persistent issue but not causing too much difficulty as we haven't been able to drive fast enough for it to be a problem on these roads. She is still generating attention, but not as much as in South Eastern Europe simply because they don't seem to know Trabants here. The fact that we are travelling in convoy is helping with attention though - especially given that the other two are equally unusual looking - a Ford Fiesta dressed up as Starsky & Hutch's Grand Torino and a Bedford Rascal painted like the A Team van. The three of us make an outstanding impression! Given the corruption and inefficiency (and/or laziness) of the officials here, we thought that we would probably not make the crossing to Turkmenistan in time before our visas run out. It's a shame but it means that we have changed our plans and will now be catching the ferry to Kazakhstan, and then go south to Uzbekistan, instead of Turkmenistan and then north to Uzbekistan. In total it will probably mean more miles in less days, but we will just see how it goes. There are a lot of teams here in Baku, many of them in a similar boat (so to speak) and it's been good to swap stories and compare frustrations. And of course, it means that we will have a quality night out tonight....! It's nice to be travelling with other people as it gives moral support, safety in numbers and more fun on the road - the CB radio was a great idea. Plus Lewis and I ran out of things to talk about in France, so it's good to have additional input! For worried relatives, we are eating well and keeping healthy. In fact, last night we had dinner with Dad. Not our dad obviously, but when we asked a random taxi driver to take us to a restaurant, he came and ate with us. This was bizarre as he spoke no English, but we managed to communicate to certain extent and some words are understandable internationally (problem, vodka etc.) And he sorted us out with a cracking meal at a great place, so we won't complain too much about the fact that we think we paid for his meal and his time!